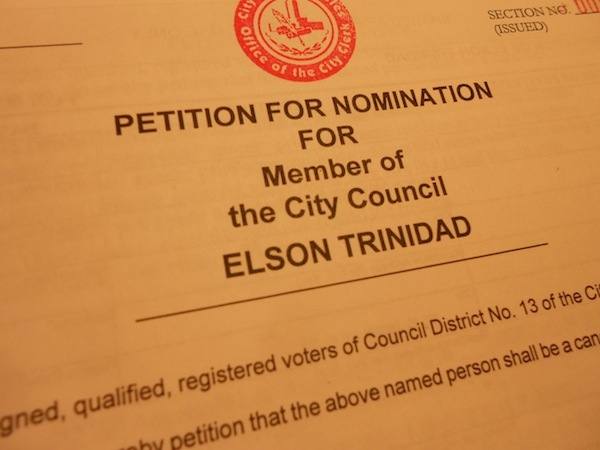 On Friday, I formally filed for candidacy for the Los Angeles City Council in the March 5, 2013 municipal election. How does one run for office? It’s a straightforward procedure albeit filled with forms and formalities. In the City of Los Angeles, there’s two entities you deal with: The City Ethics Commission and the Office fo the City Clerk. The former deals with campaign finances and compliance to its myriad regulations, the latter deals with the formal process of elections and getting on the ballot. Candidates can file several months in advance to raise money for the campaigns, and file forms with the Ethics Commission and with the California Secretary of State’s Office on declaring intent, using a treasurer or starting a campaign committee. This past week was “Candidate Filing Week” at the City Clerk’s office at Piper Technical Center, just east of Union Station. From Monday to Saturday, candidates were given the opportunity to file for office. I came later in the week to avoid long lines and long waits. I brought my friends and supporters Liza and Luis to help capture the moment on pictures and video, and they were also curious to see what the process was like. Running into other candidates is very common here; we ran into State Assemblyman Gil Cedillo, who was running for City Council, in the 1st District. Finally at the filing desk there were numerous forms to file. It was almost like applying to college. The forms included the listed occupational designation (title) one wanted to use next to their name on the ballot. I chose “Community Organizer” and had to explain the justification in a short paragraph. There were other forms, including a bio and contact information, where candidates need only list what they wanted to be made public. Then it was off to the City Clerk’s office (a temporary one set up next door especially for the elections) where I had to file three more forms, including disclosures of where my income came from in the past 12 months. After then, the next step was to pick up the ballot petitions — but due to the high volume of candidates, I would need to pick them up on Saturday. So that I did, it was much the same atmosphere though a little laid back. I ran into a candidate for City Controller named Ankur Patel and we taked about ordinary citizens taking the initiative to run for office. Truth be told, when all was said and done, 92 people filed for candidacy in the March election. I have until December 5 to collect 1,000 signatures! The quest is on…Let’s Rock This!